Welcome to Upfronts week, when the broadcast networks (or what’s left of them) announce their Fall schedules and attempt to generate billions of dollars worth of excitement from advertisers. It’s harder than ever to authoritatively analyze the thought process that goes into a broadcaster’s cancellation, renewal and pick-up decisions, because network ad revenues directly tied to 18-49 ratings are now just a piece of the puzzle. Other projected and actual revenue streams, especially international and SVOD deals (all of which require some level of ownership by the network’s affiliated studio), are now at least as important, as is delayed viewing on multiple platforms–when that viewing includes commercials. Much of that information is kept away from the public, requiring guesswork on the part of observers. There wasn’t a lot of in-between for ABC this past season. The network had television’s biggest “new” hit with the rebooted Roseanne, and the biggest new drama hit as well with its surprise smash The Good Doctor, and American Idol did fairly well in its revival, even if no one can quite figure out how its economics work. But balanced against that were a torrent of flops, from The Mayor to Inhumans to Ten Days In the Valley. The network’s strategy next season seems to be minimizing its drama load, at least for fall, while playing up unscripted, with more of its signature family sitcoms. As with NBC and FOX, it’s not a schedule designed to get anyone excited. No changes, and no need to: while Dancing is in its decline, especially with younger audiences, it still draws millions of older eyeballs, and The Good Doctor was ABC’s lottery win of the season. There wasn’t any doubt that Roseanne was going to remain the anchor of the Tuesday line-up, and if it doesn’t collapse after the novelty wears off, it will easily be able to launch THE KIDS ARE ALRIGHT, a seemingly very compatible blue-collar Irish-American family sitcom with Michael Cudlitz and Mary McCormack, from veteran TV writer/producer Tim Doyle. Black-ish and Splitting Up Together aren’t a powerhouse pair (and Splitting, unlike Black-ish, doesn’t earn critical or awards attention), but they do well enough. THE ROOKIE is a cop procedural with longtime ABC star Nathan Fillion, from Castle writer/producer Alexi Hawley, and it should give the network the best shot it’s had in years for a Tuesday 10PM hit. The only change in the 8-9:30PM block is that American Housewife is moving to the post-Goldbergs slot, where it should do fine. Modern Family will attempt to launch yet another family sitcom, SINGLE PARENTS, which is exactly what it sounds like and includes TV hands Leighton Meester and Taran Killam in the cast, but it may have a relatively off-beat voice, coming from New Girl‘s Liz Meriwether and JJ Philbin. The new 10PM drama A MILLION LITTLE THINGS is a soft-concept story about a group of friends, and creator DJ Nash was behind the flops Truth Be Told and Growing Up Fisher, with David Giuntoli and Ron Livingston as the closest thing to star power, so the network must think they’ve found something they can promote. Shonda Rhimes has left the ABC building, but her Thursday night remains. Grey‘s is a marvel of consistency well into its 2nd decade, and Station 19 has done OK as a lead-out. Murder, though, has been showing signs of running out of steam. The network has sworn off Friday dramas, and instead is putting two of its weaker sitcoms in the 8PM hour, followed by the low-cost unscripted Child Support and 20/20. It will be interesting to see how Boat fares against FOX’s rebooted Last Man Standing, but otherwise there’s little of interest here. Perhaps ABC’s biggest statement comes on Sundays, where it’s going low-stakes with an all-unscripted line-up. DANCING JR is unlikely to be more than middling fare, and the interesting decision is the spotlight fall slot for THE ALEC BALDWIN SHOW, which will probably generate more headlines than viewers. However, with the huge number of cable networks airing dramas on Sunday nights, ABC may have felt like a money-saving hour that draws some social media attention was the way to go. 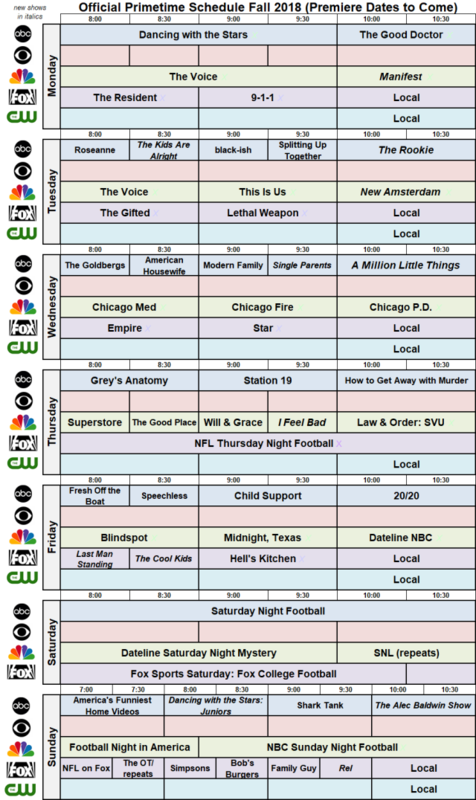 The network is fully stocked for midseason, with the Goldbergs spin-off SCHOOLED, dramas THE FIX, GRAND HOTEL and WHISKEY CAVALIER, and the returns of American Idol, The Bachelor/Bachelorette, and For the People.